From the time he stepped off the sidelines and into the broadcast booth in 2009, Jon Gruden was considered a “top candidate” for countless coaching vacancies in the NFL. It turns out, there was really only one job the now former “Monday Night Football” color analyst ever really wanted. “I can’t believe how much he loves the Raiders,” longtime sports talker and host of the official Oakland Raiders podcast J.T. 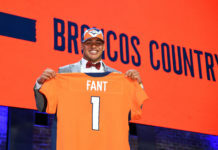 the Brick said on Mile High Sports AM 1340 | FM 104.7 this week. He spoke with Nate Lundy and TJ Carpenter one day after Gruden’s introductory press conference. “He won a Super Bowl with Tampa Bay and beat the Raiders, lost in the ‘tuck rule’ game with the Raiders in New England and I think that loss has eaten at him his entire career,” he continued. That loss — in the 2001 AFC Divisional round — is one of the key reasons Gruden may have passed on the countless coaching opportunities that came his way between his firing with the Tampa Bay Buccaneers in 2009 and his decision to return to the Raiders for the 2018 season and beyond. 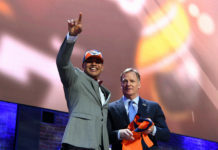 Broncos fans will remember that former Raiders owner Al Davis traded Gruden for Tampa Bay’s 2002 and 2003 first-round draft picks, 2002 and 2004 second-round draft picks, and $8 million in cash. Some of that unfinished business is improving on a 1-7 record against the Denver Broncos as head coach of the Raiders. Much of that is returning Oakland to the playoffs, something they have done just once since Gruden defeated Bill Callahan in Super Bowl XXXVII. The biggest piece may be his role as flag-bearer when the team relocates to Las Vegas. That doesn’t mean Gruden will ignore the fans in Oakland, however. “Let me leave you with this,” J.T. said. “The biggest takeaway from yesterday is Gruden’s passion for Oakland. 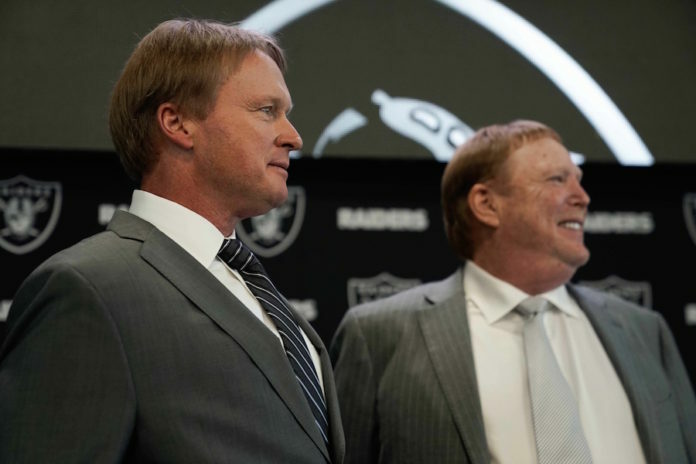 You’re not going to hear about Las Vegas in the next couple of years coming from Gruden. You’ll hear it from the Raiders and their organization that they have boots on the ground already and they’re building that stadium in Vegas, which is going to be right behind Jerry’s World (AT&T Stadium in Arlington) as the best stadium in all of football. But Jon Gruden doesn’t want to talk about Vegas. He really wants to win in Oakland. Click here to listen to the full interview with J.T. the Brick, including his thoughts on Raiders roster moves that might result from Gruden’s hiring, or listen in the podcast below. Catch Mornings at 5280 with Nate Lundy, Shawn Drotar and TJ Carpenter every weekday from 7a-9a on Mile High Sports AM 1340 | FM 104.7 or stream live any time for the best local coverage of Colorado sports from Denver’s biggest sports talk lineup. Download the new mobile app for Apple or Android.